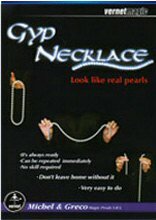 You show a beautiful necklace made of “poppit” beads and give it to the audience to be examined. Then you ask anyone to call a number. You pull the necklace apart showing a long string of beads and give it to the spectator. Then ask him to pull on the ends of the necklace and the string breaks at the exact chosen number. You can repeat the effect with different numbers.